Finally, a gritty inner London neighbourhood regentrified into a culture hub has got the stylish five-star hotel it deserves. 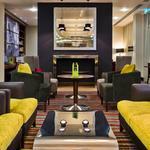 Hilton London Bankside, perched opposite Tate Modern on the industrial side of Southwark Street, aims to appeal to leisure travellers – Shakespeare’s Globe and Borough Market are also close by – as well as a business clientele. in bathrooms, concrete-effect porcelain lobby tiles and even concrete-effect carpets in other public areas. 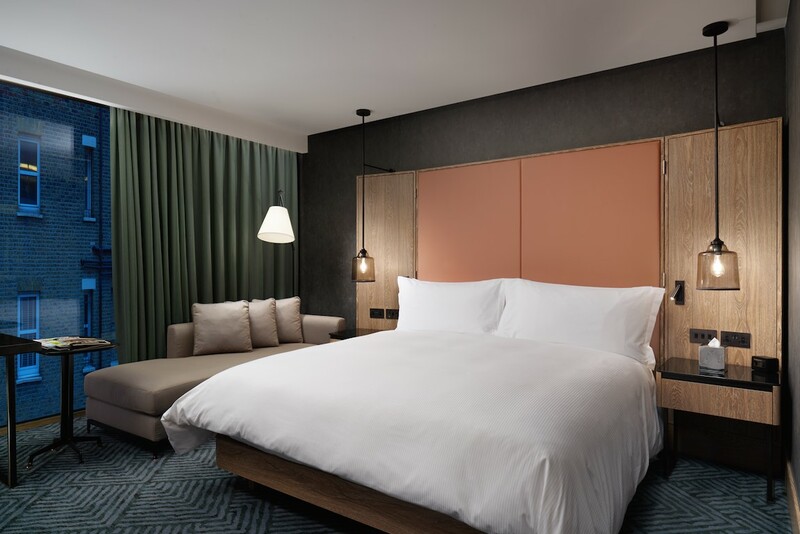 Despite this hommage to the hotel’s former incarnation as a warehouse, the lobby is warm and welcoming, the rooms softly lit and upholstered, and foxes which pay tribute to the hotel’s first ever visitor in a capital awash with urban foxes are replicated in both room and lobby motifs. 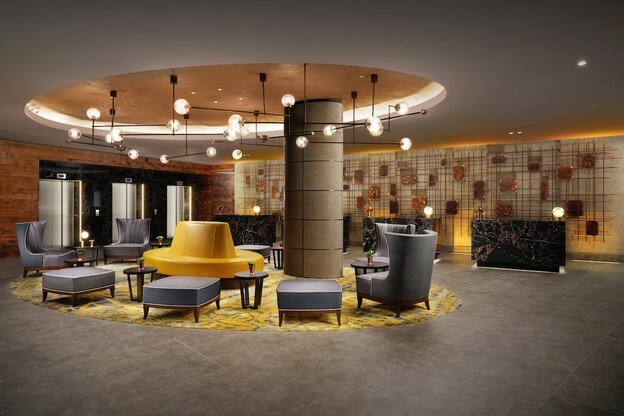 While proximity to the brick walls of neighbouring commercial buildings steal daylight and are tough for a hotel to overcome, Hilton Bankside draws guests inwards with huge, comfortable beds, giant built-in TV’s and for some a welcome chaise-longue. Desks have built-in plugs and towels, bathrobes and slippers are commendably commodious and fluffy. but it would be nice to have had the bathroom vanity kit(available only on request) and Nespresso machine now commonplace in hotels of this category. Instead, there are standard tea and coffee-making equipment concealed in a dresser along with a mini-fridge containing complimentary water and soft drinks. 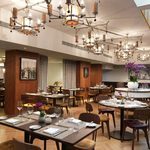 Hilton hopes to see its OXBO restaurant become a dining destination, but to succeed it will have to expand and modernise its menu and make more of the provenance of ingredients sourced from Borough Market. Like the executive lounge next door, the restaurant is a slightly too large and industrial space in which to feel instantly comfortable, although the food is good. 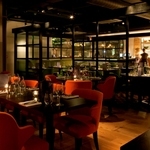 The Distillery Bar, with its wall of old pennies and vintage soda syphons, is a more intimate space which takes it cocktails seriously – a shame virtually all are gin-based, although bartenders known their bourbon and can whip up a decent Manhattan or Old-Fashioned. Bar snacks of calamari in tempura batter, charred pork belly and plump, sizzling chorizo were good enough to serve as dinner on their own. A basement swimming pool is long enough to attract serious swimmers, although too dimly-lit and industrial in feel to draw leisure bathers. Free wi-fi is standard throughout this intriguing hotel which has brought glamour to the grottier end of SE1 and is bound to be packed full once the expanded Tate Modern opens its doors.